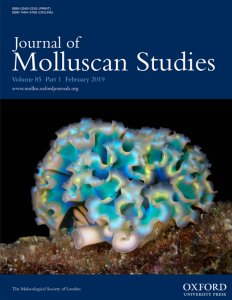 The Malacological Society of London is dedicated to the advancement of research and education on molluscs. 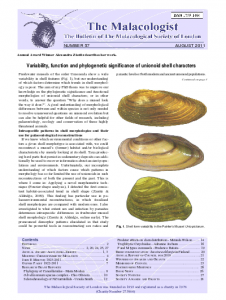 It is an international organization based in London, UK, and welcomes as members all who are interested in the scientific study of molluscs. The Society was founded in 1893, with the objectives “to advance education, research and learning for the public benefit in the study of Mollusca from both pure and applied aspects”. It is a registered charity (Reg. No. 275980). Hypselodoris apolegma (Yonov, 2001). 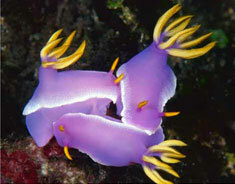 Mating specimens, 30mm in length, photographed in Lembeh Strait, Sulawesi, Indonesia, at 8 m depth on sand slope of patch reef. Photograph by M.J. Adams. Janthina janthina (Linnaeus, 1758). 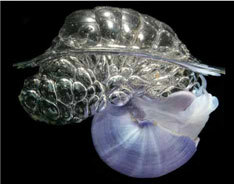 This pelagic snail floats on the sea surface, attached to a raft of mucus bubbles, and preys on cnidarians. New South Wales, Australia. Photograph by D. Riek.